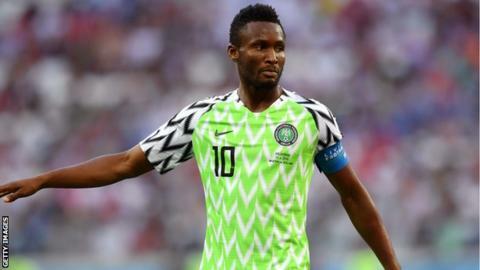 Captain John Mikel Obi is the most notable absentee from Nigeria's squad for their final 2019 Africa Cup of Nations qualifier with Seychelles and a friendly against Egypt later this month. The 31-year-old, who has been impressive at English championship club Middlesbrough, has not played for his country since he captained the Super Eagles at last year's World Cup in Russia. Despite public assurances from coach Gernot Rohr that Mikel would make a return, the player has been left out of the 23-man squad for the home fixtures in Asaba on 22 and 26 March respectively. But the door appears to remain open for the former Chelsea star. "The coach is very happy that Mikel is playing well for Middlesbrough at a very good level," team spokesman Toyin Ibitoye told BBC Sport. "He's definitely part of the team but coach Rohr believes he has to take things easy with him so as not to overload him," Ibitoye added. Rohr has handed maiden call-ups to uncapped Denmark-based striker Paul Onuachu and under-20 defender Valentine Ozornwafor, while there is a recall for former U-17 World Cup winner Victor Osimhen. Struggling Leicester City striker Kelechi Iheanacho has been overlooked after failing to score a goal for club or country since September, but England-based quintet of Wilfred Ndidi, Alex Iwobi, Leon Balogun, Semi Ajayi and Oghenekaro Etebo are included. Also present is the experienced quartet of Odion Ighalo, joint-top scorer in qualifying with six goals, Troost-Ekong, Ahmed Musa and John Ogu. Champions in 2013, Nigeria have already secured qualification for this year's tournament in Egypt after failing to reach back-to-back events in 2015 and 2017.